A divorce fair, described by its organisers as a wedding fair's "evil twin", has been organised to give advice to troubled couples. Leicester divorcee Clive Langley said he was encouraged to set up the free event after witnessing the poor advice often given to couples separating. The fair, being held at Leicester City Football Club's Walkers Stadium, will offer guidance from counsellors. Various professionals will also be offering help at the fair on 11 June. Mr Langley said he wished he had the opportunity to attend a divorce fair when his relationship ended but made it clear the event was not designed to encourage divorce. He said: "We do not want to encourage people to split up, we would much rather people come along and get advice before they make what can be a life-changing decision." If current divorce rates continue, 45% of marriages are likely to end in divorce, according to trends from the Office of National Statistics. Half of those marriages will end in the first 10 years of wedlock. Clive Langley said he hoped thorough advice and counselling, spouses can resolve their differences rather than end a relationship. "We want people to stay together, to really stop and think about the affect that it will have on the children," he added. 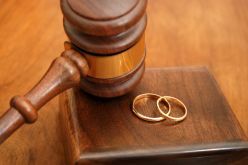 The event is open to anyone contemplating divorce, people going through the process and co-habiting couples separating.